About the pig it’s said, “Everything but the squeal.” Or, in Spanish, “del cerdo, hasta los andares.” Everything but its waddle. From the pig come fine cuts such as loin chops and tenderloin, big leg joints to turn into hams, bacon! but also extremities and innards. Nose to tail eating. Or, this week in my kitchen, cheek to trotter. Pig's trotter, split in half. Ibérico pork cheeks, ready to braise. 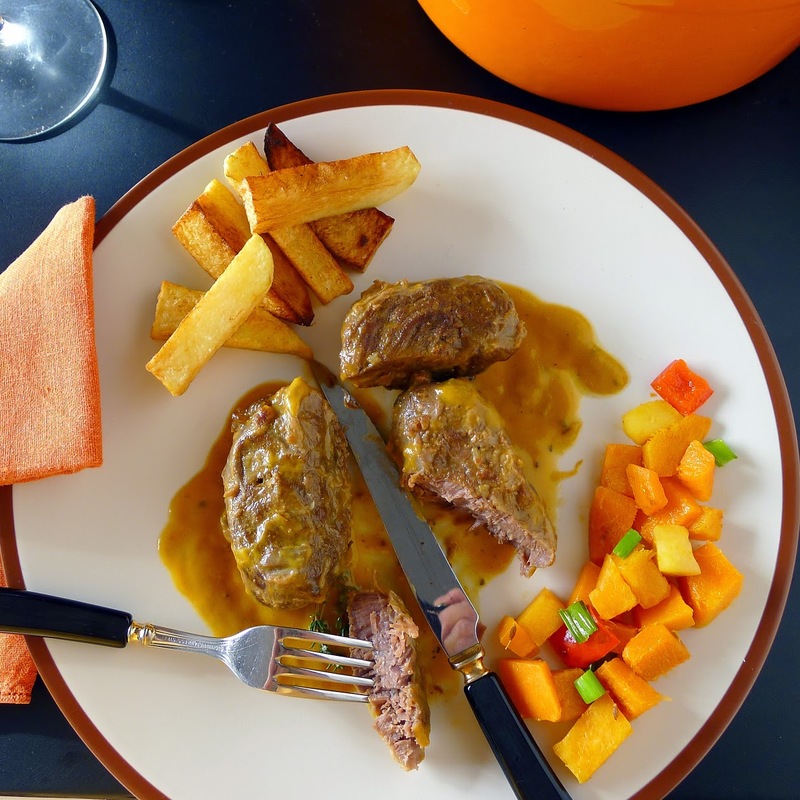 Braised pork cheeks served with butternut squash sauté and olive oil fried potatoes. The cheeks will shrink considerably during cooking. The braising vegetables are pureed to thicken the sauce. Remove excess fat from the cheeks. Wash them and pat dry. Sprinkle with salt and pepper. Heat the oil in a cazuela or braising pot. Brown the meat on both sides. Remove. Add the carrot, leek and garlic to the pot and sauté until onion begins to brown, 5 minutes. Stir in the pimentón and immediately add the Sherry. Raise the heat to cook off the alcohol, then add the stock. Tie the thyme, rosemary, bay and celery together and add to the pot. Taste the liquid and add additional salt if necessary. Return the meat to the pot. Simmer the meat, covered, turning it from time to time, until it is very tender, about 1 ½ hours. Remove the pork cheeks to a plate. Discard the herbs. Puree the pan juices and vegetables in a blender to make a smooth sauce. Return the sauce and cheeks to the pot and reheat the meat gently. After braising, pork cheeks are tender and succulent. 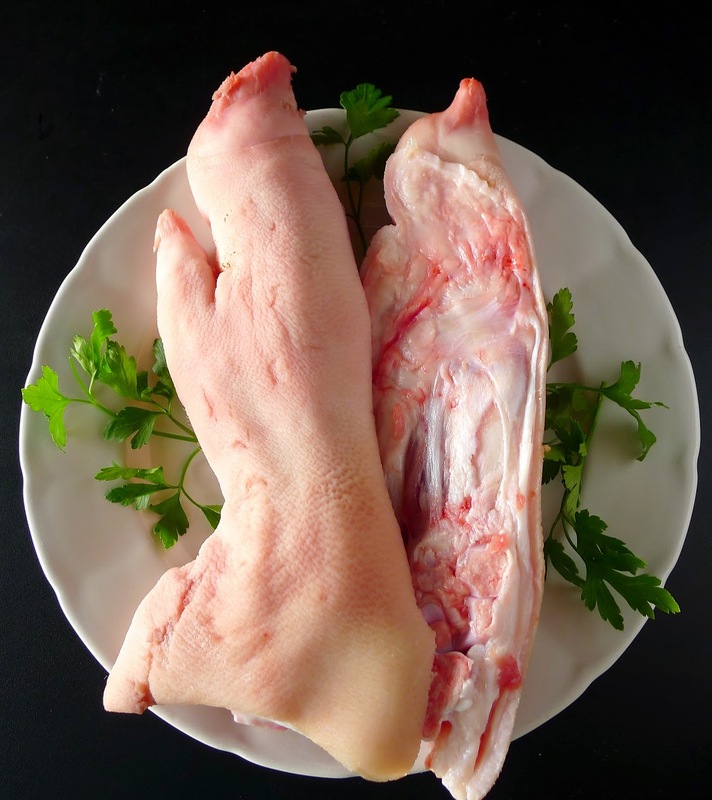 I finally “get it” about pigs’ feet, after various experiments in eating them and cooking them. They fall into the same category as snails—the sauce is so delicious that it makes preparing something a little oddball, with a weird texture to boot, worth all the trouble. 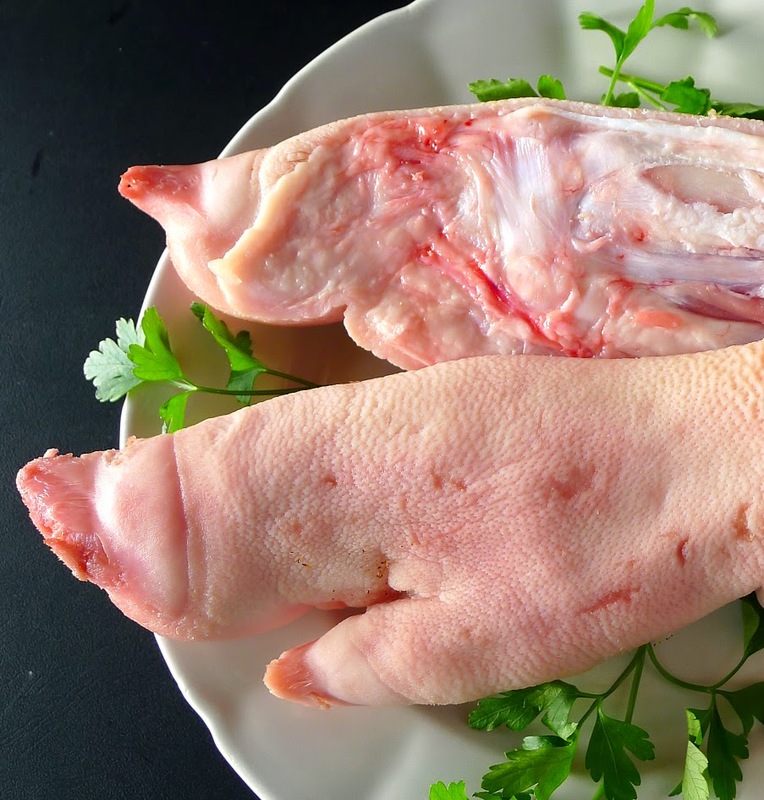 Pigs’ feet have a lip-sticking, gelatinous texture that either you are crazy for or else you don’t want to know. Well, let me tell you, that pigs’ feet don’t have “meat.” Meat is, really, muscle, and feet don’t have muscle. They have thick skin and gelatinous cartilage. The broth they cook in, which sets up into a firm gelatin, makes a serious soup or sauce. 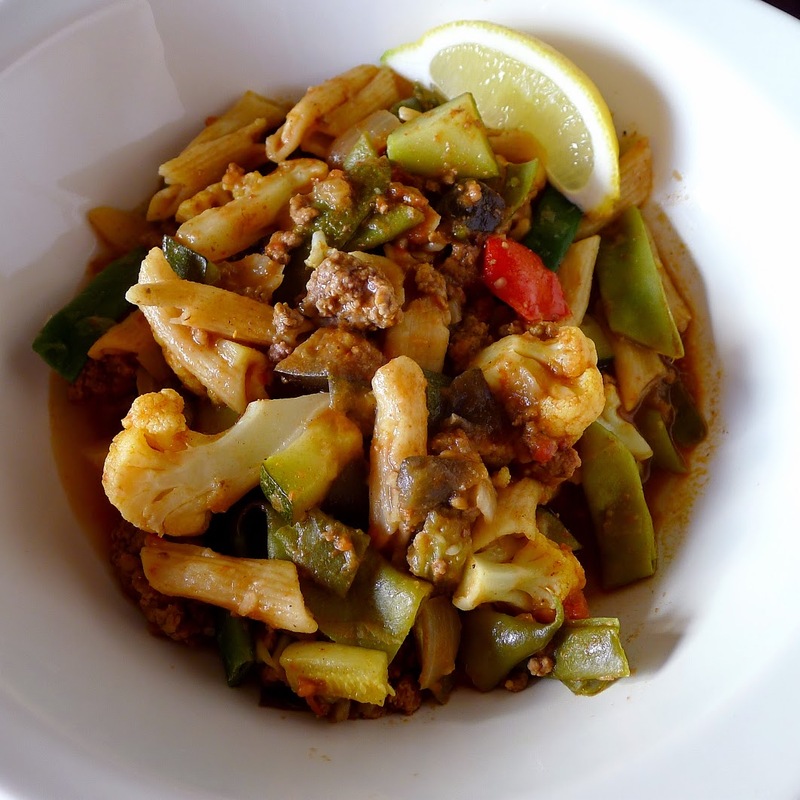 The “meat,” cut into bits and stewed in a flavorful sauce is unctuous, a little slippery, and ever so delicious. (If you want a meatier version, add 4 ounces of pork shoulder meat to cook with the trotters.) 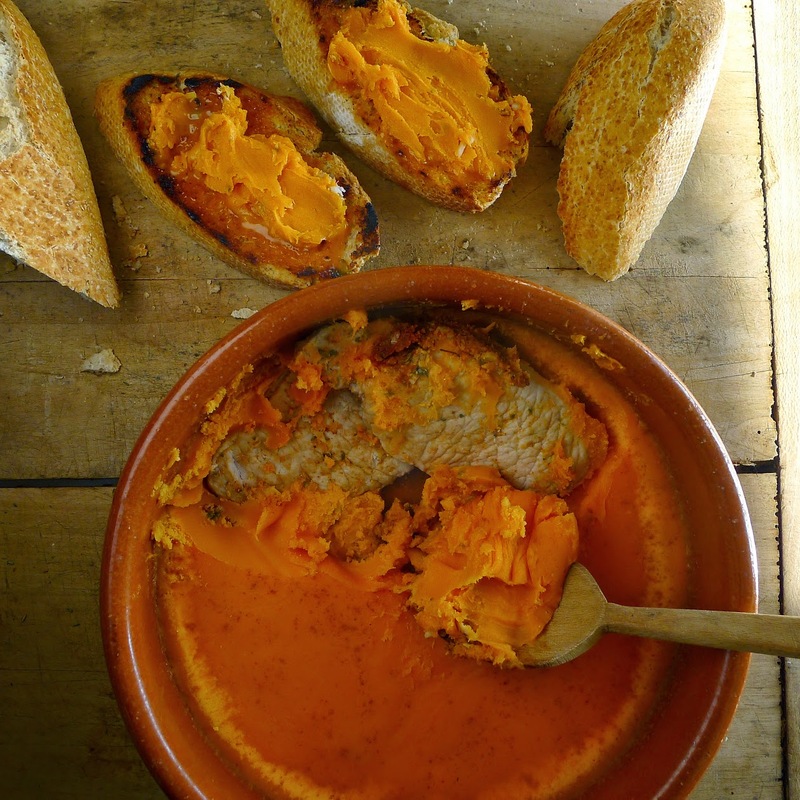 Serve the pigs’ feet very hot with lots of fresh bread for sopping up the sauce. Note: choricero and ñora peppers are dried sweet peppers. The choricero is long and skinny; the ñora is round and plum-sized. If not available, use additional pimentón in the recipe. Put the pigs’ feet in a large stew pot with water to cover. Bring to a boil, boil 5 minutes, and drain. Rinse out the pot and put the trotters in with fresh water to cover. Bring to a boil. Add the leeks, carrots, choricero peppers, bay leaves, peppercorns, cloves, 1 tablespoon salt, and vinegar. When the pot boils, cover and reduce heat to a simmer. Cook until pigs’ feet are fork-tender, about 2 hours. Lift the pigs’ feet out of the broth. When they are cool enough to handle, remove all the bones and thick parts of the skin and discard them. Cut the remaining meat, skin, and cartilage into bite-size pieces. Skim out the carrots and choricero peppers and reserve. Discard the bay leaves. If using the choricero or ñora peppers, split them open and scrape the pulp with the blunt edge of a knife. Save the pulp and discard the skins. When the broth cools, skim off and discard the fat that comes to the surface. Heat the oil in a deep skillet and sauté the onions until they begin to brown, 5 minutes. Add the garlic and sauté 2 minutes. Stir in gradually 2 cups of the broth in which the trotters cooked. Add remaining ½ teaspoon salt. Return the pan to the heat and cook, stirring, until the sauce thickens. Return the reserved meat to the sauce. Simmer, covered, 30 minutes. Slice the reserved carrots and add to the sauce. Heat. Serve the pigs’ feet with sauce very hot, garnished with chopped parsley. Slow-cooked pork cheeks are fork-tender. 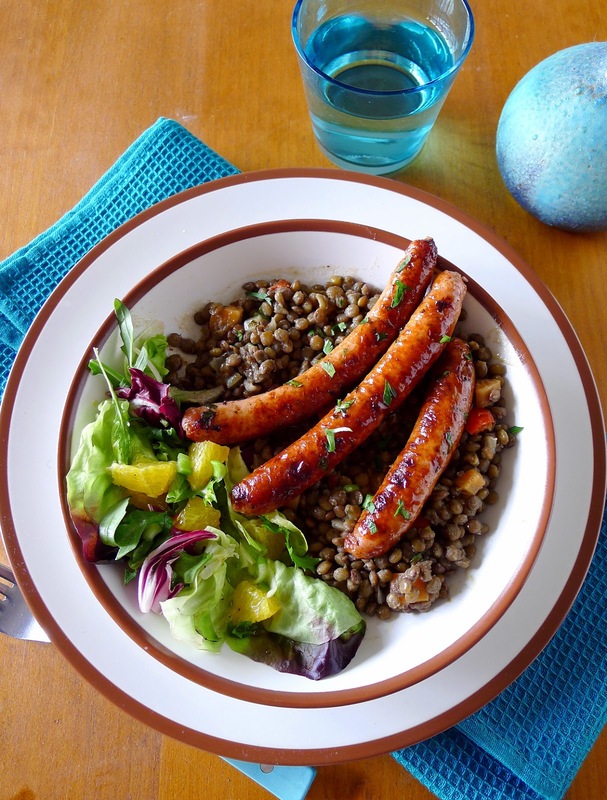 THE SAUSAGE SPECIAL, WITH A SIDE OF—LENTILS! I haven’t quite finished with my porky extravaganza (see previous posts on pork loin and chorizo sausage). This week I’m enjoying salchicha, fresh pork link sausage. But, I’m giving equal time and place on the plate to a vegetarian lentil dish that can be served on its own or as a side with the sausages. 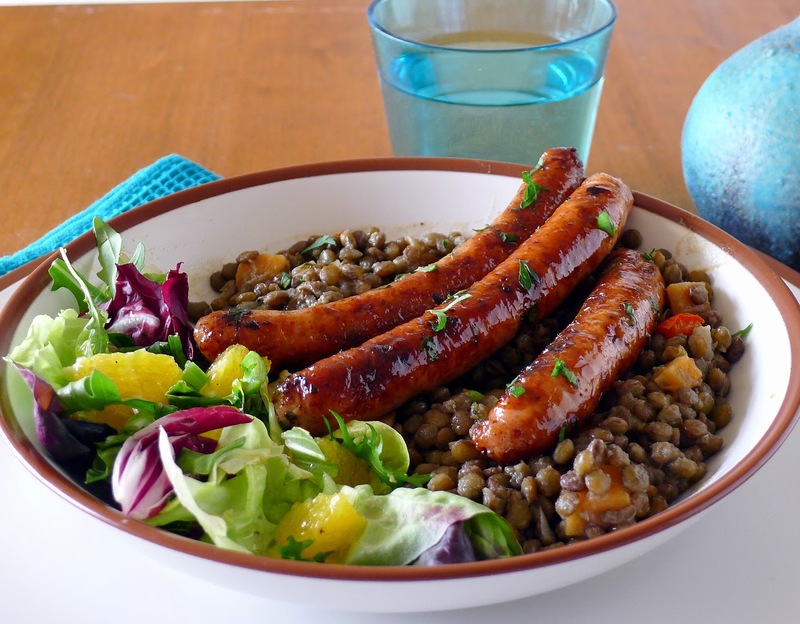 Sherry-glazed sausages, lentils and crisp salad--great lunch dish. Salchicha is a fresh sausage that must be kept refrigerated and cooked before eating. 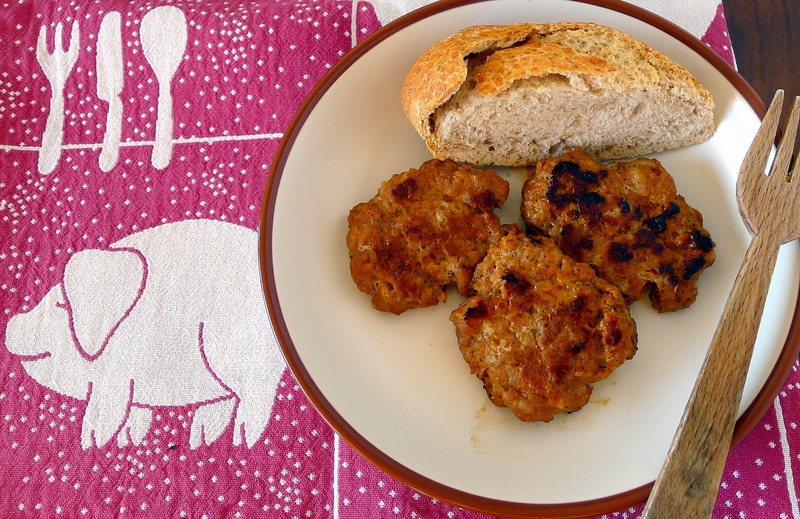 It’s similar to the breakfast links you’re probably familiar with or to sweet Italian sausage. The Spanish version consists of pork meat and fat ground together; seasoned with salt, lots of white or black pepper, nutmeg, garlic, oregano and parsley, and stuffed in sausage casings. It’s ready to eat immediately, without curing time. 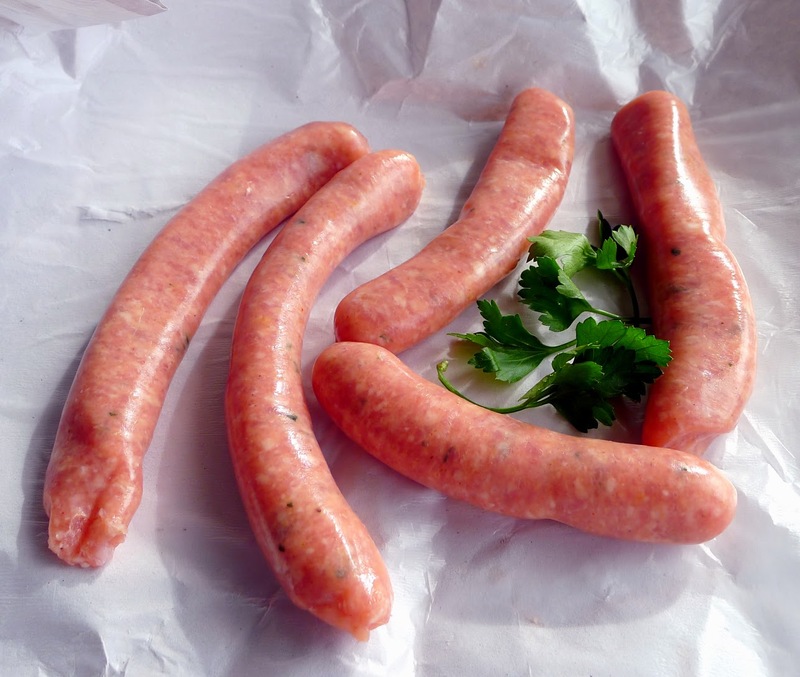 Fresh link sausage is also sometimes called longaniza blanca. Another version, called salchicha criolla or longaniza roja has pimentón (paprika) and hot pimentón or chile as well. Salchicha can be fried, grilled or simmered in soups. I’ve prepared an easy version, frying the sausages, then simmering them with fino Sherry, a dish often served in tapa bars. 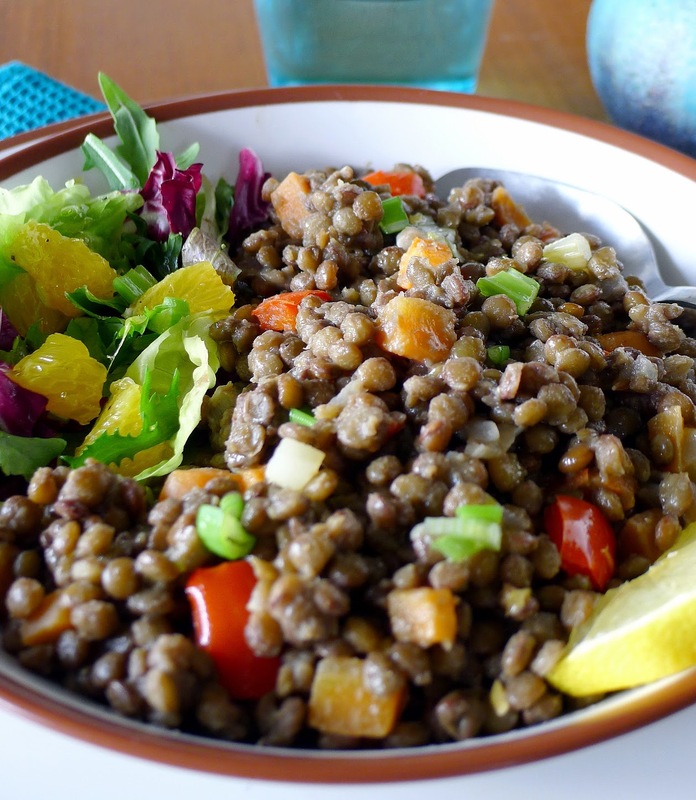 The lentils along with a salad with a sharp citrus dressing make great side dishes. Or, hold the sausages and serve the lentils as the main event. If the sausage pieces are to be served as a tapa, cut the links into 1 ½ -inch pieces. Serves 4-6 as part of a meal, or 10-12 as a tapa. Heat the oil in a skillet and brown the sausage pieces on all sides. Add the Sherry and cook on a medium heat for 3 minutes until the sausages are slightly glazed. 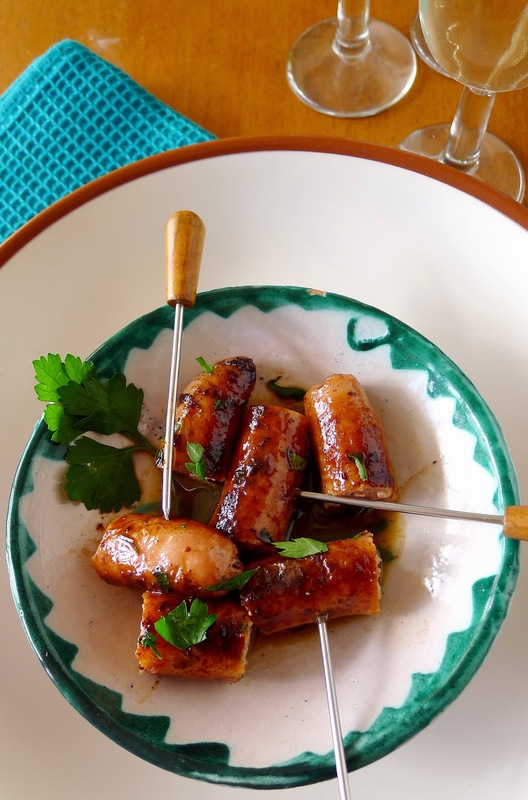 Serve the sausages with the pan juices, sprinkled with parsley. 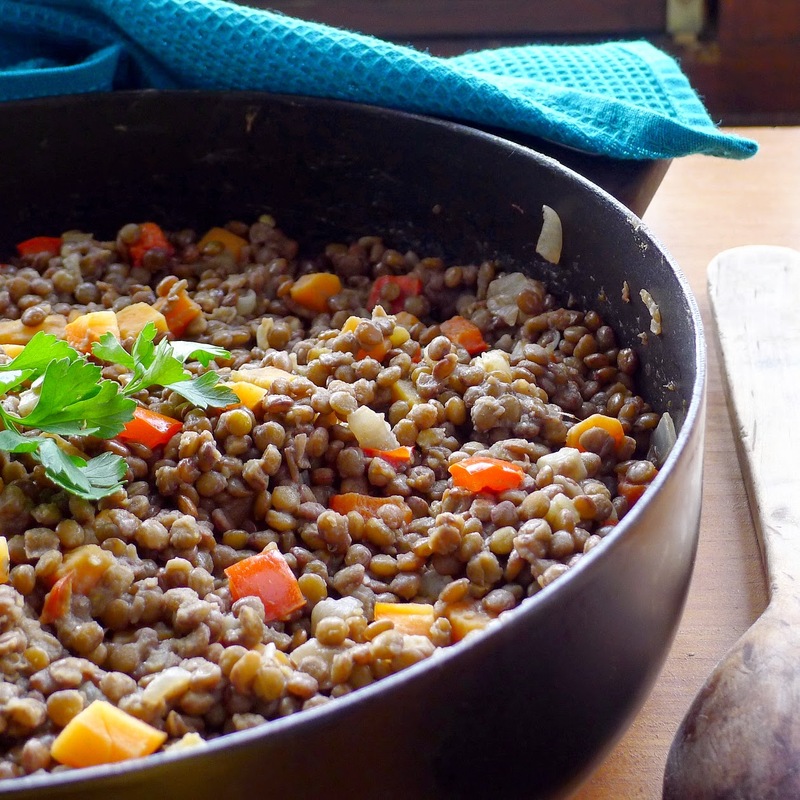 Vegetarian lentils get flavor from a sofrito of vegetables. Lentils are what Don Quixote ate on Fridays. Or, so Cervantes tells us in the first paragraph of the novel. 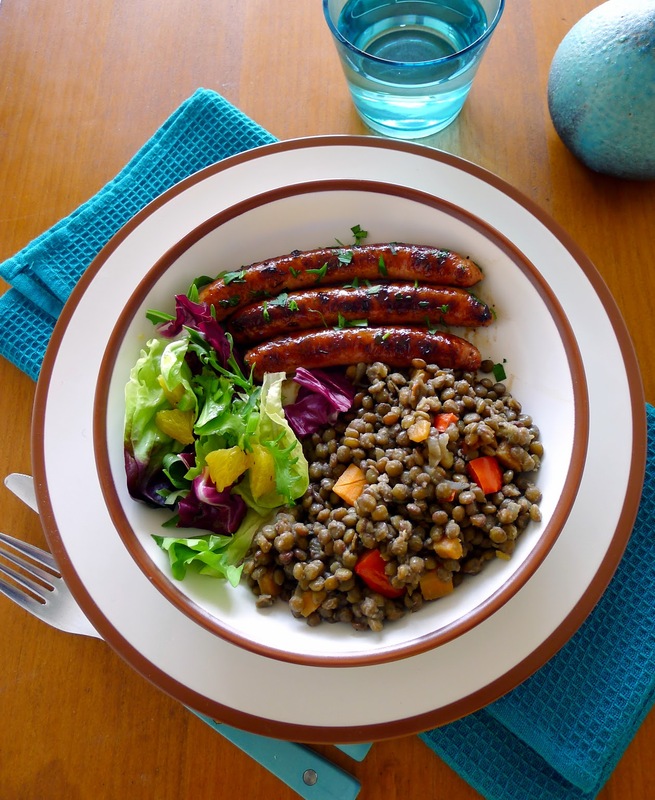 Because it was Friday—usually a day of abstinence from meat in the Catholic Church—they were certainly lentils viudas, “widowed,” bereft of meat or sausage. Nevertheless, well flavored with the olive oil of the region, garlic, onions, and spices such as cumin and pepper, they were probably a substantial and tasty meal. 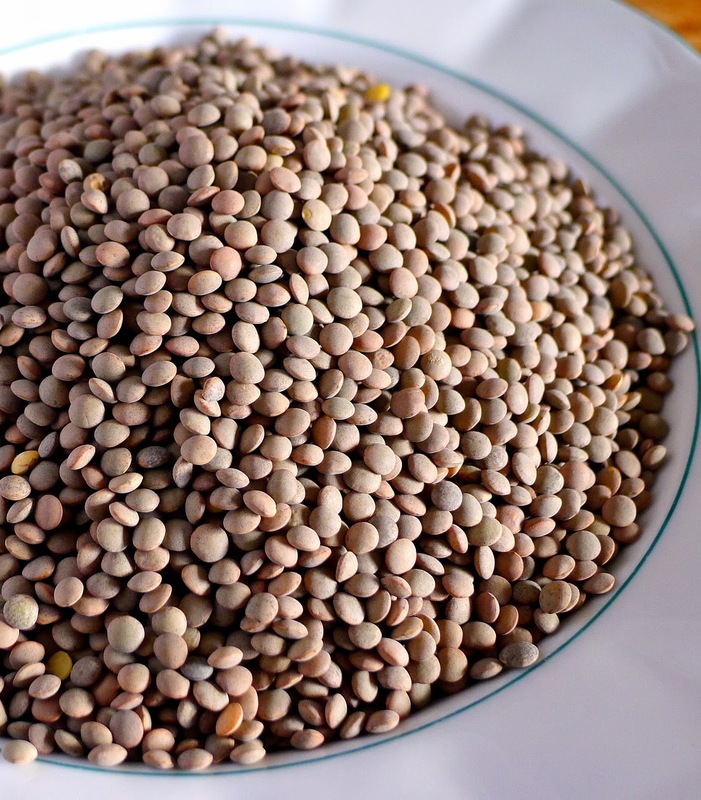 A splash of vinegar or lemon juice at the end of cooking really jacks up the flavor of lentils. Serves 4 as a main dish or 6 to 8 as a side dish. Place the lentils in a pot or cazuela and add water, slivered zest, bay leaves and salt. Bring to a boil and cook, covered, for 8 minutes. Drain the lentils, saving the liquid. Discard the bay leaves. If using saffron, soak it in 2 tablespoons hot water for 15 minutes. Heat the oil in a pot or cazuela and sauté the carrots, onion, celery and red pepper for 3 minutes. Add garlic and sauté 5 minutes. Add the cumin seed and sauté 1 minute. Stir in the lentils and 2 cups of the reserved liquid. Add the cloves, pepper, saffron, and additional salt, if necessary. Bring to a boil and simmer, covered, for 20 minutes, or until lentils and carrots are tender. Add additional liquid as needed to keep the lentils from scorching on the bottom. Add vinegar and cook 3 minutes longer. Allow to stand for 10 minutes before serving. Drizzle a little extra virgin olive oil over the lentils immediately before serving. If desired, serve them garnished with chopped egg. Serve with lemon wedges to squeeze into the lentils. Lentils make a satisfying meal. Use this dressing on salad greens, on cooked vegetables such as beets, carrots or asparagus, or on grilled fish fillets. Oranges add a sweet tang. Grate a little orange zest into a small bowl. Peel the orange removing all the white pith. Cut the sections free from membranes and chop the sections. Add to the bowl. Stir in the vinegar, oil, scallions, salt and pepper. Chorizo to feed a crowd. It’s pig-out week! A pre-Lenten time of pig butchering and celebration of all foods porcine. Last week I was eating high-off-the-hog with marinated pork loin. 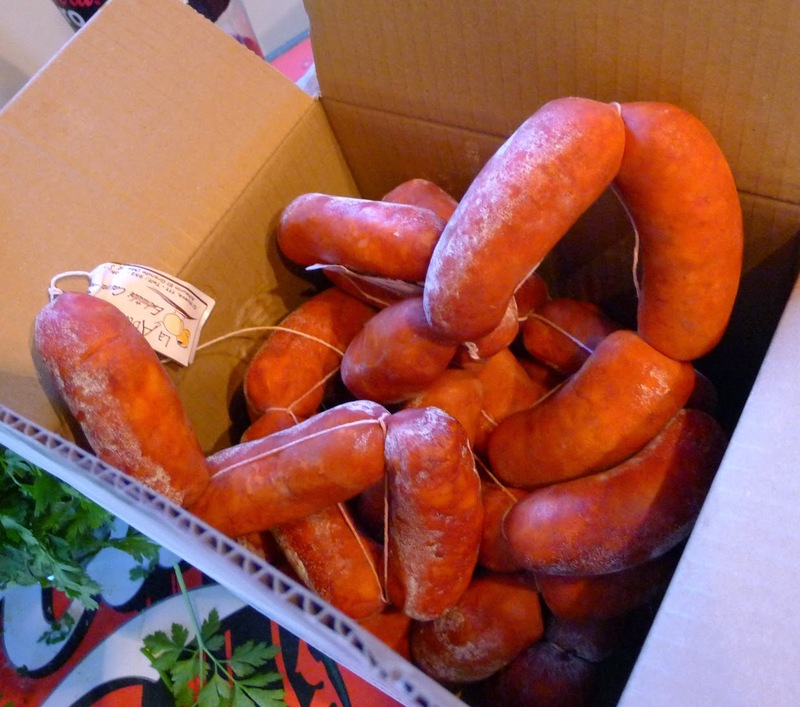 This week I’m making chorizo, Spain’s most distinctive sausage. Back when I was developing recipes for the cookbook, MY KITCHEN IN SPAIN (HarperCollins 2002), Spanish chorizo was still very difficult to find in the United States. Intending to include a recipe for making chorizo in the book, I experimented with sausage-making in my kitchen. To stuff the sausages I used a simple plastic pastry bag with a ½-inch nozzle. Having tied off the bottom of the casing with cotton string, I eased the casing onto the nozzle, filled the funnel with the sausage mixture and pressed the plunger to force it into the casing. It worked just fine. I tied-off the sausage in 4-inch links. 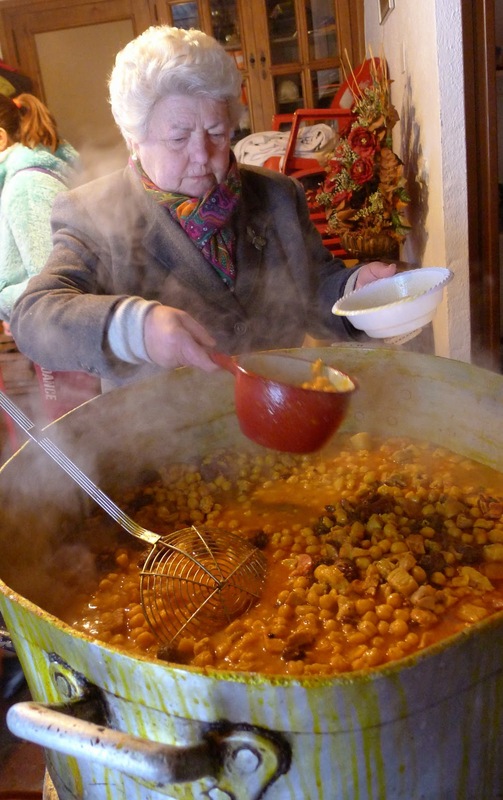 I hung the chorizos from a rod in a well-ventilated, unheated shower room for a week, then cooked them on the grill and in cocidos and potajes (soups and stews). By the time the cookbook was edited, chorizo had become widely available, so my recipe was left out of the book. This week, I’m not making real sausages in casings. I’m making the spiced chorizo meat mix, then using it as sausages, patties, and picadillo, ground meat for stuffing. For how to make “real” Spanish chorizo, both semi-cured and dry-cured, for both professional cooks and dedicated amateurs, see CHARCUTERÍA--THE SOUL OF SPAIN by Jeffrey Weiss (Surrey Books-Agate; 2014). Here you'll find detailed instructions about equipment and the “secrets and science of charcutería “ (precise measurements and exact temperatures make a difference), with the curing salts needed for safe processing and where to get them. But, back to my home kitchen. Fat is what makes sausage juicy. The greater the proportion of fat to lean, the juicier will be the sausage. My local butcher suggested using all panceta, which is pork belly, fresh uncured bacon, a cut which is almost equally fat and lean. (Yes, in Spanish it's panceta, not pancetta.) You could also combine equal parts lean pork with pork fat. Have the butcher grind the pork belly or use a meat grinder (food processor doesn’t work well). 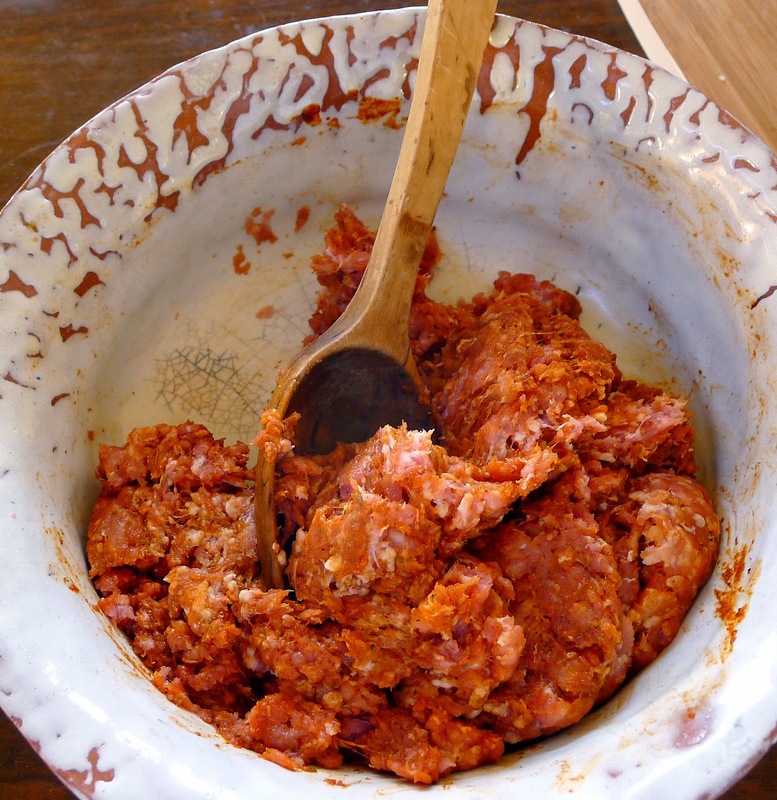 La prueba del chorizo--taste-testing for seasoning. 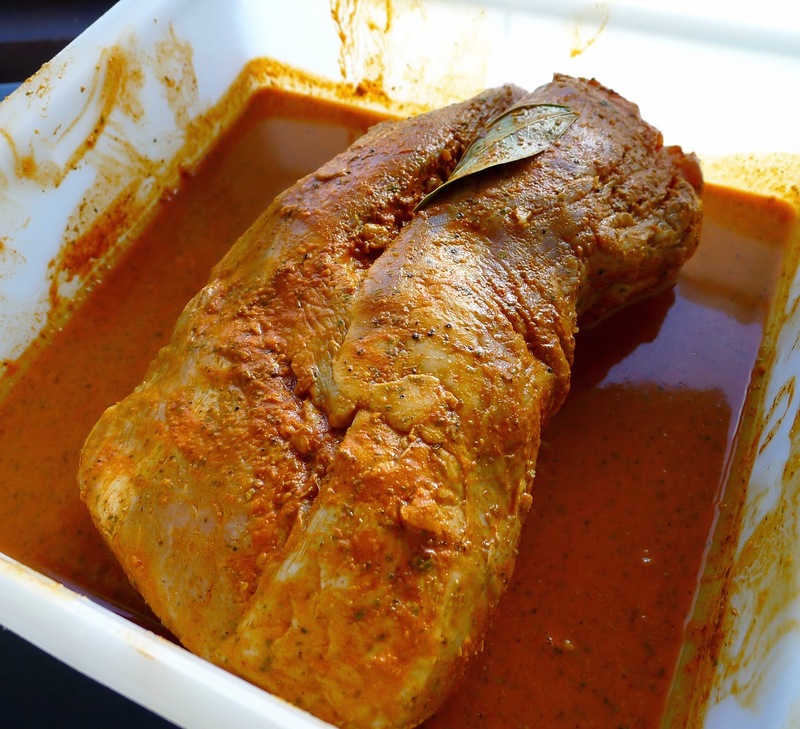 After mixing the meat with the spices, refrigerate it for 24 hours to allow flavors to develop. 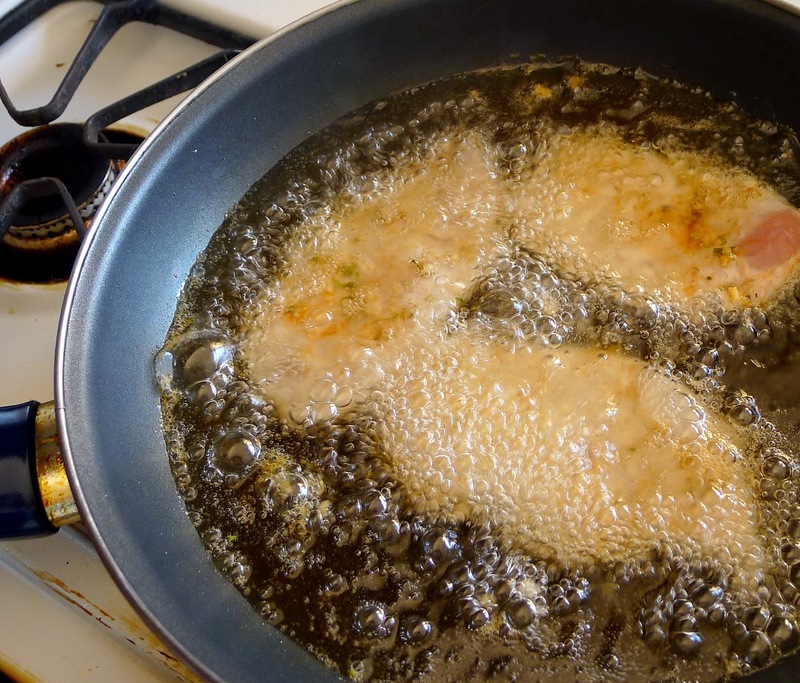 Then, make a small patty of meat and fry it in a small skillet, about 2 minutes on each side or until cooked through. This is the prueba de chorizo, the taste-test. Does the mix need more salt? If you have used the lesser amount given (½ tablespoon), it probably does! Adjust the seasoning, then fry another prueba to taste. 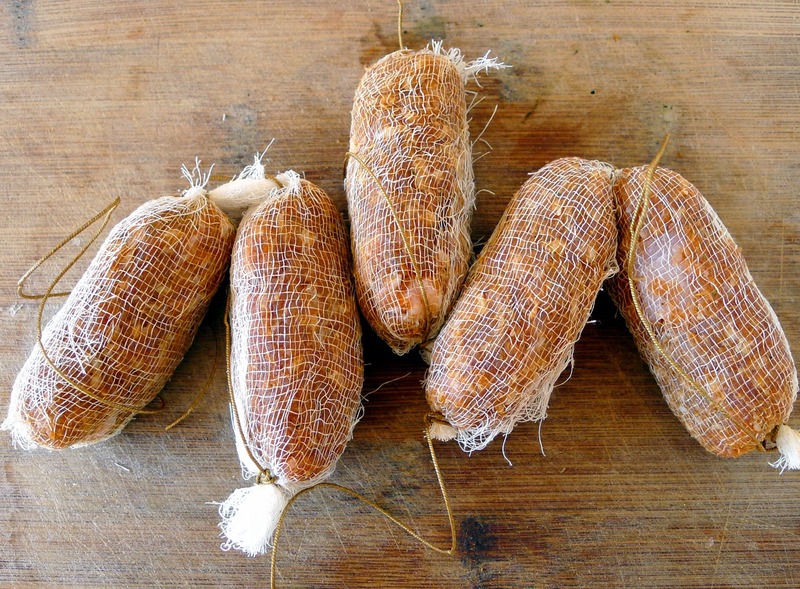 Instead of sausage casings, this chorizo is wrapped in cheesecloth. At this point the sausage is ready to cook. I wrapped some of it in cheesecloth and tied-off links resembling sausages. I made meatballs with some to drop into lentil soup. I used some to stuff onions (recipe below). The chorizo keeps, covered and refrigerated, for up to a week. The recipe makes about 16 (2-ounce) sausages. Ground pork belly mixed with spices and salt. 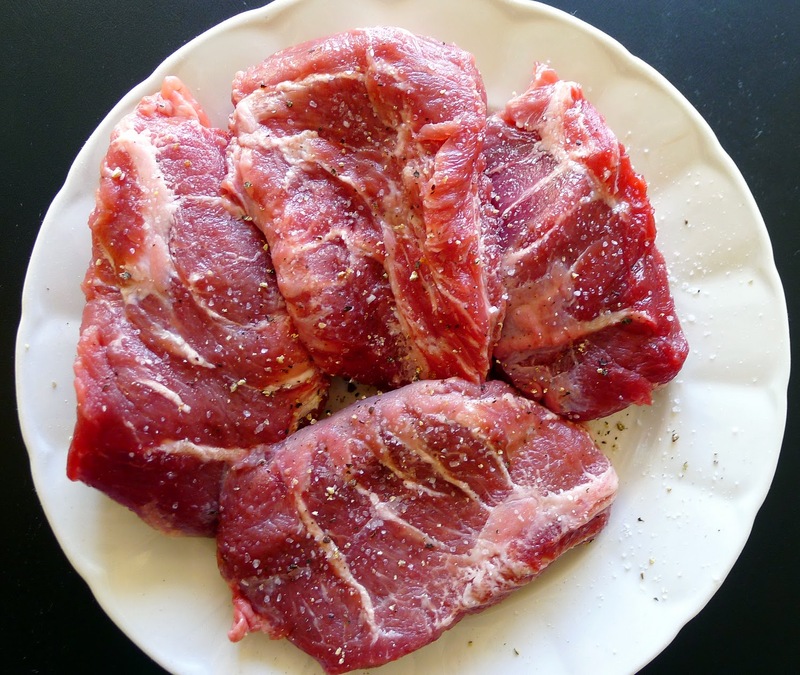 Place the meat in a large non-reactive bowl (glass or earthenware). In a blender combine the garlic, wine, salt, pimentón, oregano, pepper, cloves and water. Add this mixture to the meat. Use a mixer with a paddle attachment, a wooden spoon or hands (sterile surgical gloves can be used) to thoroughly mix the spice mixture into the ground meat. Test the mix for seasoning. Fry a small patty of it until thoroughly cooked and taste it. Adjust salt and other seasoning as needed. At this point the chorizo can be stuffed into sausage casings or made into patties or meatballs. If not to be cooked immediately, store refrigerated. Use within 1 week. 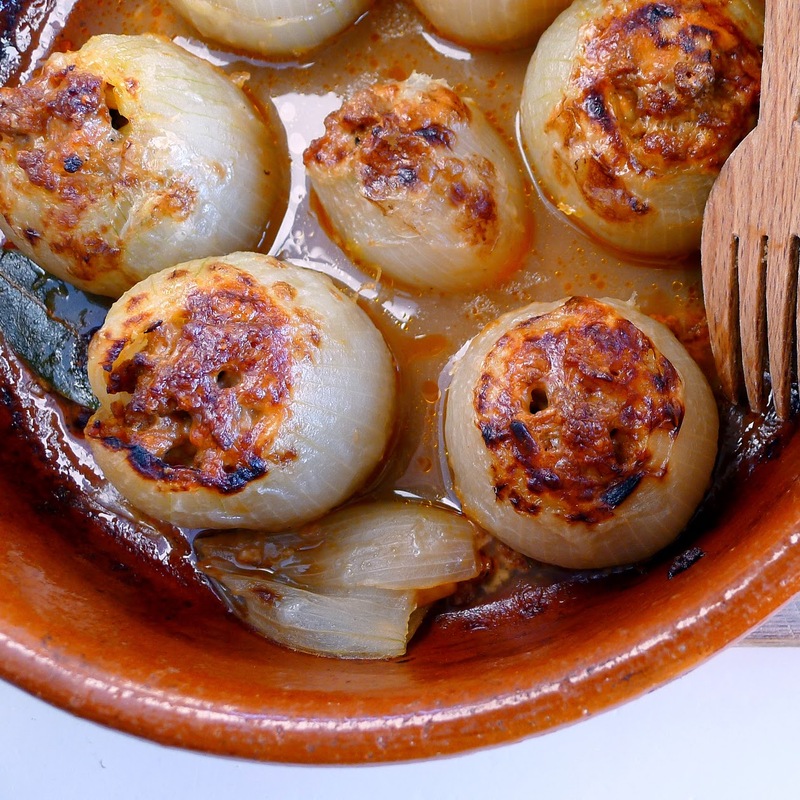 Onions stuffed with chorizo and baked with cheese on top. Onions are a main ingredient in the making of morcilla, blood sausage. 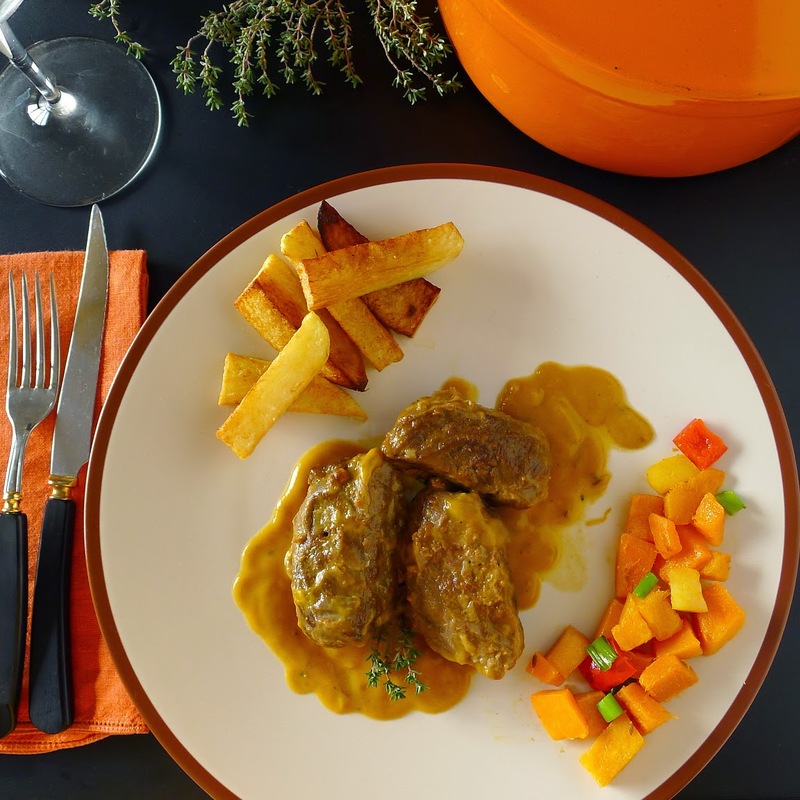 With rice or other fillers such as potatoes or even pumpkin, they are combined with fat and pigs’ blood to provide the substance of the sausage. 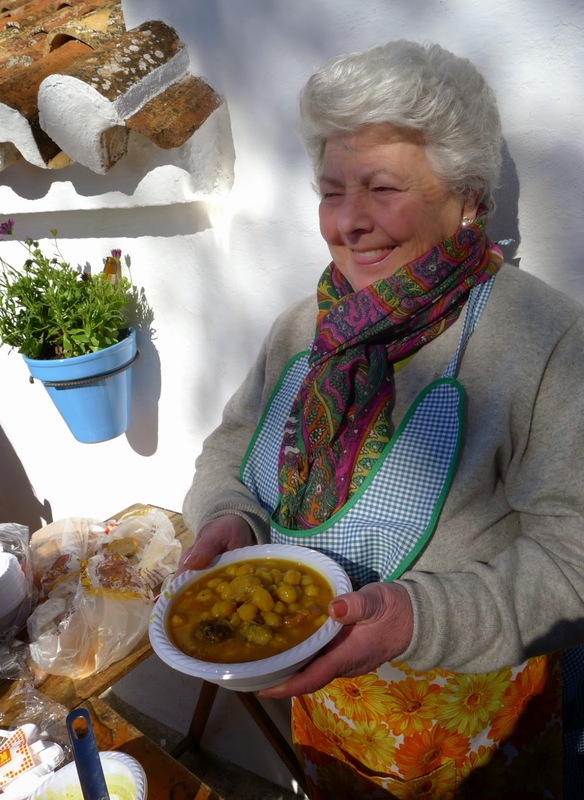 In Extremadura, where folks gather for the traditional pig butchering, this stuffed onion dish is traditional. The inner parts of the onion are ground up for the morcilla. Sausage mixture is used to stuff the onion shells, which are roasted until tender. The stuffed onions make a nice starter, served with salad with a citrusy dressing. Wash the onions. Place them, unpeeled, in a pan with water to cover plus salt. Bring to a boil and cook for 15 minutes. Drain, saving 1 cup of the cooking liquid. Heat the oil in a skillet. Fry the pine nuts and cumin seed until lightly toasted and skim them out. 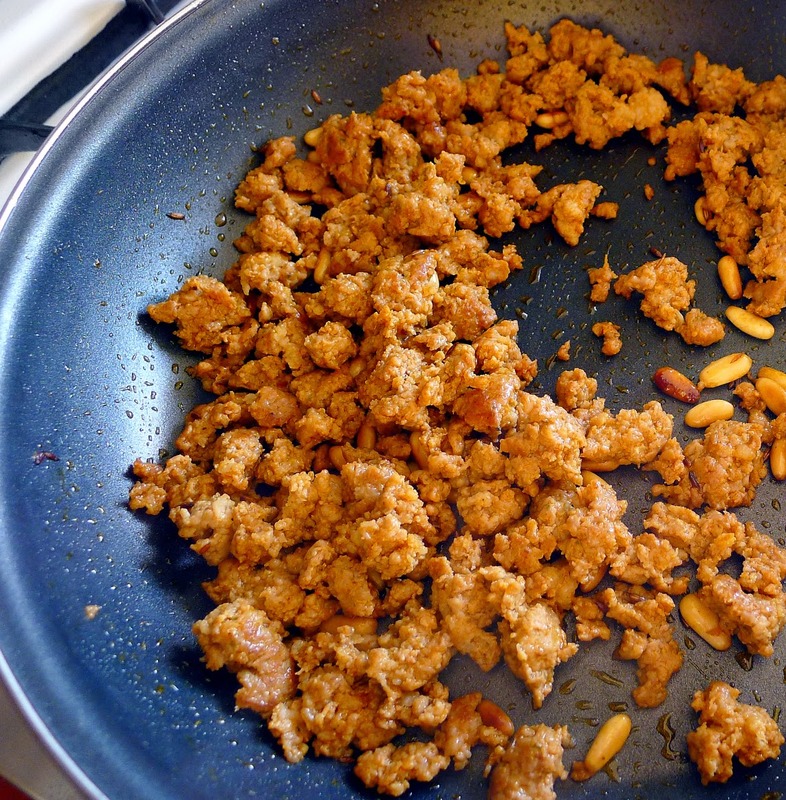 Add the chorizo to the pan and brown it, using a wooden spoon to break it up into small pieces. Stir in the pine nuts, cumin, wine and aguardiente, if using. Cook for 5 minutes. Use a spoon to stuff the onion cavities with the chorizo mixture. Place the onions in a cazuela. Combine the flour with 1 cup of the reserved onion liquid and pour over the stuffed onions. Cover the cazuela with foil and bake for 25 minutes. Top the onions with grated cheese, cover with foil and return to the oven for 25 minutes. Remove foil and place under broiler for 4 minutes, until tops are browned. Note the glorious January sunshine. 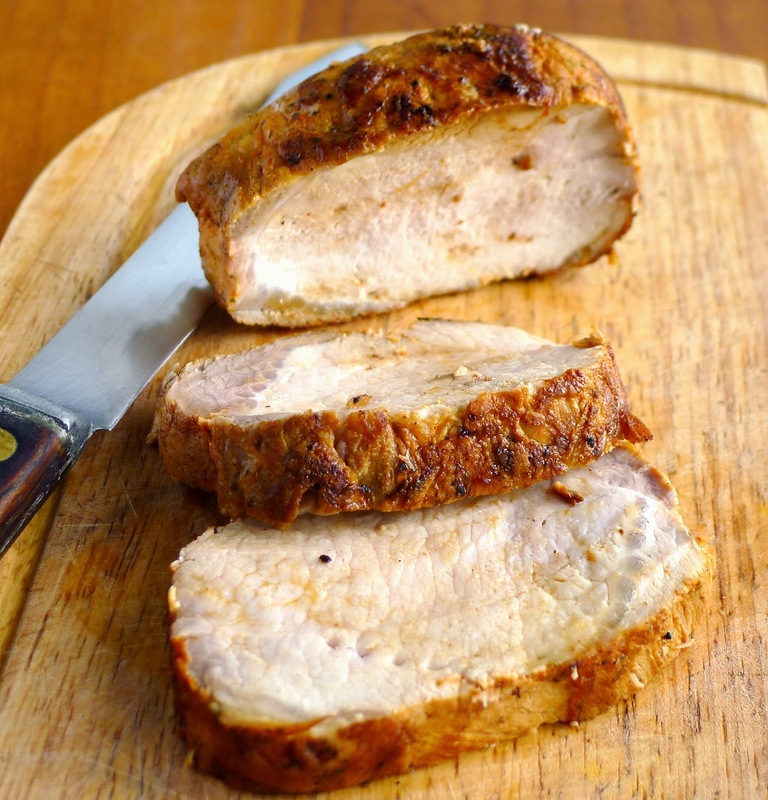 Tender, juicy pork loin for a lovely dinner. A cada cerdo llega su San Martín, For every pig, its day of reckoning arrives. This old saying refers to the holiday of San Martín (November 11) that marks the beginning of the matanza—hog slaughtering—season in the central regions of Castilla-León. Here in southern Spain, the pig slaughtering time comes later, in January, when conditions are cold enough. Hog butchering in traditional rural families was a time for celebration, because it meant food in the larder for the coming year. Cured hams, several kinds of sausages, lard, salted pork fat, ribs, trotters, ears, tail, were produced from the butchering and carefully stored to feed a family during many months. 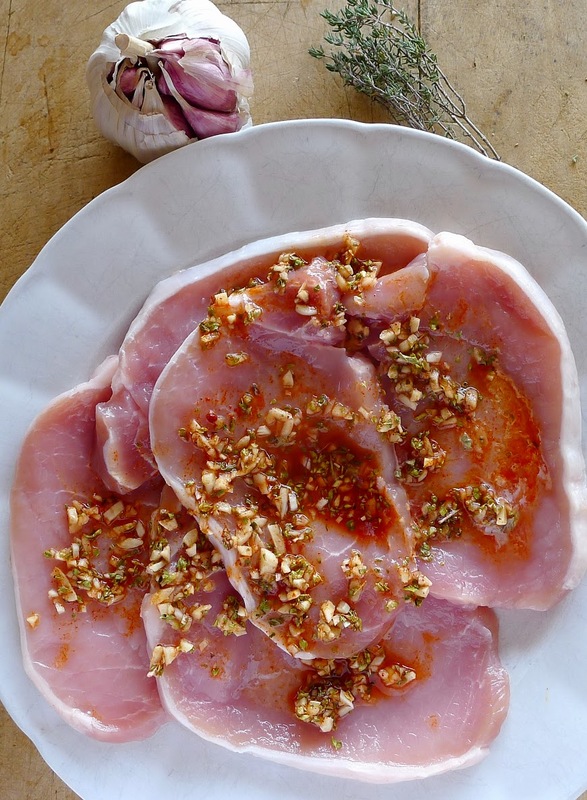 Pork loin marinates with vinegar, herbs, pimentón. Undoubtedly, the choicest cut of the pig is the loin, which is boned and preserved in adobe, a marinade that keeps the pork conserved for several days in cold weather. It can be sliced and fried, as required. Or, after marinating, the loin can be cooked in lard or olive oil and kept, totally covered in the fat, as a confit. My version of the marinated loin isn’t meant to be a conserve. The meat acquires flavor and juiciness from the marinade, then it's roasted. It can be served hot or as a cold-cut for sandwiches. Served with chard, potatoes, squash and figs. 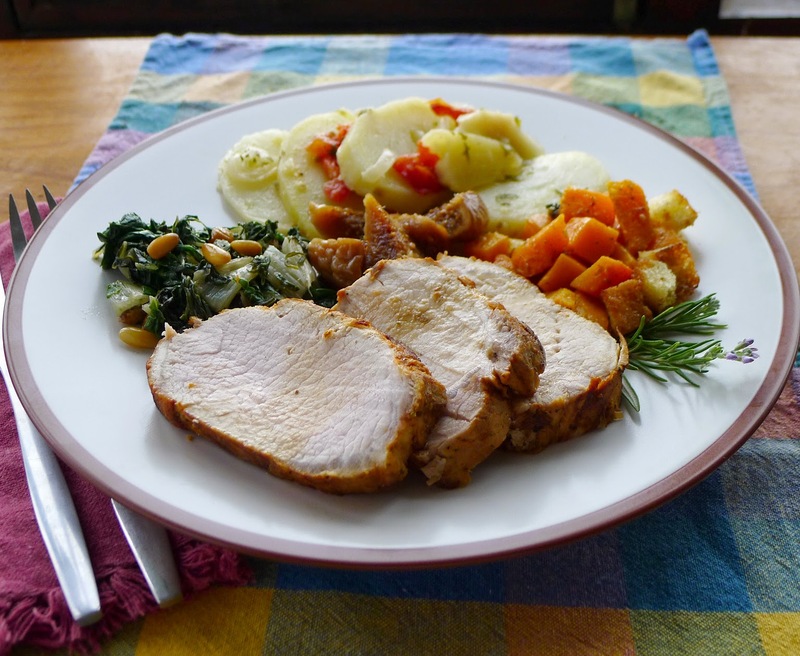 Place the pork loin in a non-reactive container (glass or earthenware). In a small bowl combine the crushed garlic, pimentón, oregano, thyme, rosemary, peppercorns, salt, 1 tablespoon of the oil and vinegar. Pour this over the loin, rubbing it to cover all the surfaces. Cover the container and marinate the pork, refrigerated, for two days. Turn the pork in the marinade twice a day. Drain the meat and pat it dry. Allow to come to room temperature. Heat the remaining 1 tablespoon olive oil in a heavy oven-proof skillet or roasting pan. Brown the pork loin on all sides. Place the pan in the oven and roast until pork is done. Meat should be juicy, only slightly pink in the center. If using an instant-read thermometer, it should register 145ºF. Depending on thickness of the meat, this will take from 40 to 60 minutes. Allow the meat to rest for 10 minutes before slicing. Manteca colorá--red lard with sliced pork loin. 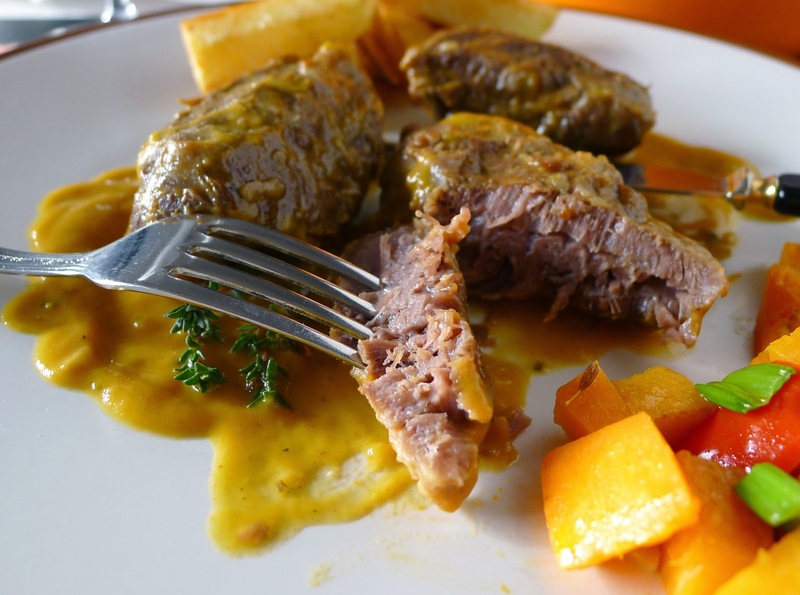 In La Mancha, the loin is slow-cooked in olive oil, then packed in an orza, a deep earthenware jar, completely immersed in oil which protects the meat from the air. 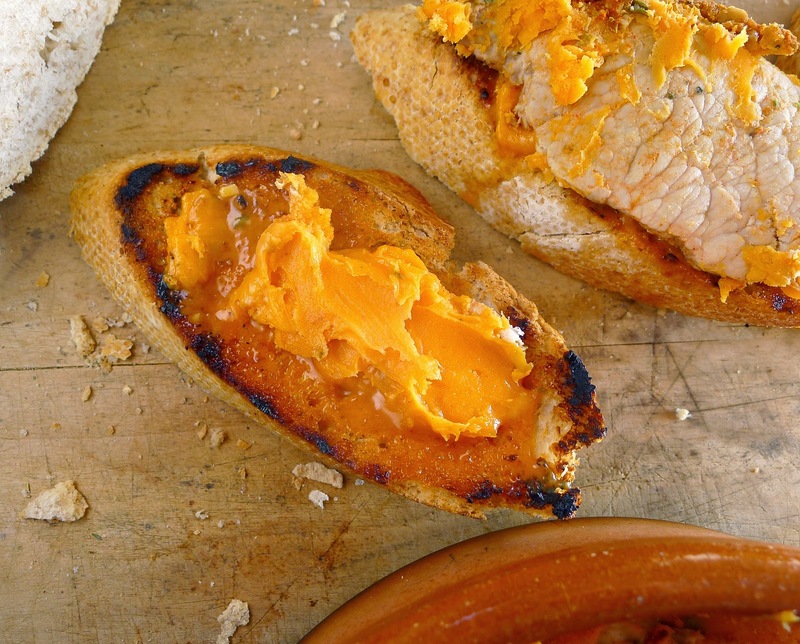 But, in Andalusia, it’s cooked in lard that’s colored and flavored with pimentón, sweet paprika. 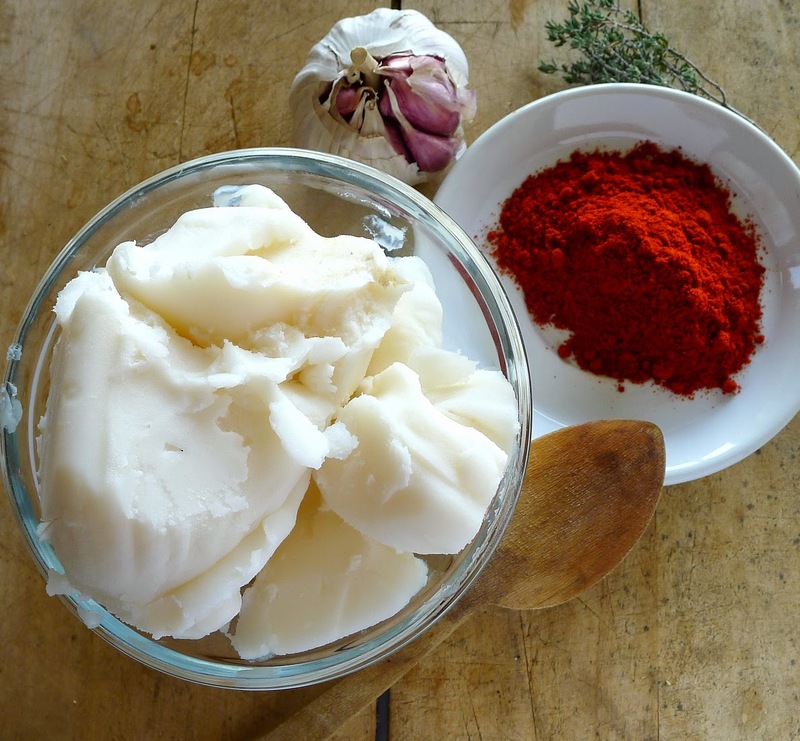 The red lard is used as a spread and as a cooking fat. Absolutely delicious spread on slabs of grilled bread. A pair of eggs fried in lard with a slice of the loin alongside makes a hearty supper. Better than butter! Lard flavored with garlic, oregano and pimentón. Yes, lard is a fat—and not nearly so healthful as olive oil. But, surprisingly, it has 20 percent less saturated fat by weight than butter! Processed lard sold as shortening is usually hydrogenated—bad. Get leaf lard from a butcher, chop it finely, heat it until melted and strain it. The crispy bits left after rendering are chicharrones, cracklings. Fry pork in melted lard. Pour lard over the fried pork. 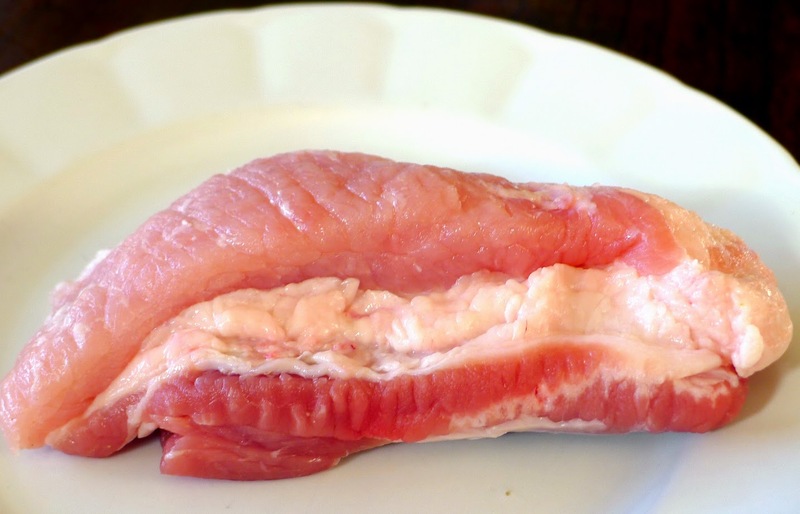 Place the slices of pork loin in a shallow bowl. Combine the crushed garlic, 1 teaspoon of pimentón, oregano, thyme, salt and vinegar. Spread half this marinade over the pork. Turn the slices and spread the remaining marinade on the pork. Cover tightly and refrigerate at least 8 hours and up to 48 hours. Melt the lard in a heavy skillet. Carefully add half of the pork slices and their marinade to the lard. Fry, turning once, until pork is cooked through, about 5 minutes. Remove the pork. Fry the remaining pork in the same manner. Scrape any remaining marinade into the lard. 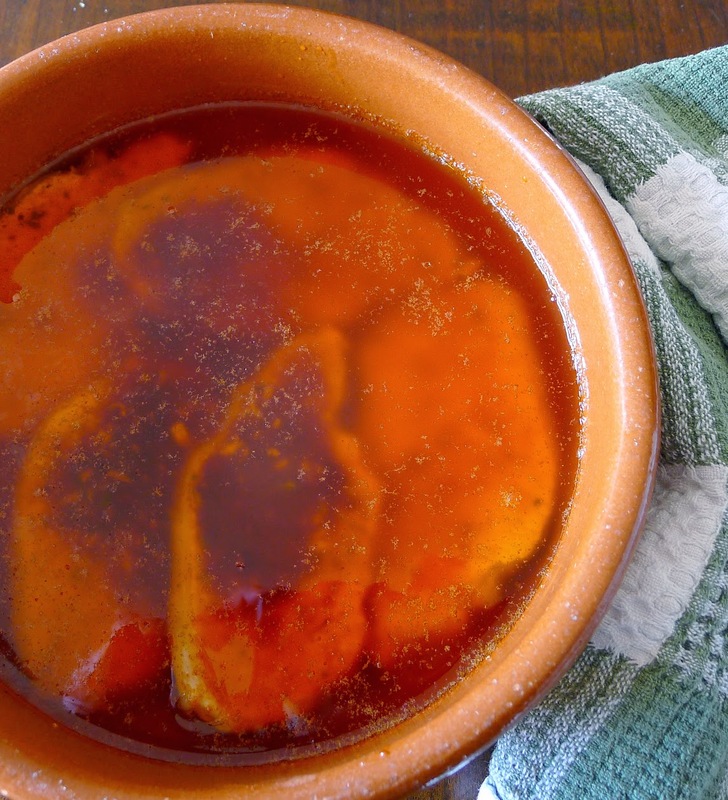 Place the pork slices in an earthenware cazuela or bowl. Remove the lard from the heat. Add the remaining 1 tablespoon of sweet pimentón and smoked pimentón to the hot lard. Carefully pour the melted lard over the pork slices. Allow to cool completely, then cover and refrigerate. The lard solidifies as it cools. The meat and lard keep up to 2 weeks. I won’t call it a “New Year’s resolution.” But, it’s my INTENTION this year to shed a few pounds/kilos. I got the results of my year-end health checkup—all good, happy to report. Cholesterol, blood sugar, blood pressure, all in high-normal range. But, on the accompanying report, the doc listed, along with hypothyroidism, high blood pressure and high cholesterol, sobrepeso. Excess weight. I used to barely control my weight by sticking to a low-carb diet—with the occasional paella on special occasions. But when tests showed incipient kidney disease, the doctor advised low-protein eating. Chicken or fish, every other day. “What do I eat on the other days?” I wailed. “Pasta, rice,” he replied. I must say that I have enjoyed every-other-day vegetarian meals. I love eating toasted whole grain bread with olive oil and tomato. Potaje of garbanzos and veggies. Pasta with pisto. But, I started putting on the pounds/kilos. I put together a diet plan for myself, based on a basic low-calorie diet prescribed for diabetics. No sugar whatsoever (easy for me, I stopped with the sugar several years ago). No alcohol (this is hard—I love drinking wine). Small portions of high-carb foods, preferably whole-grains. (Potatoes, carrots, peas and legumes count as high-carb foods.) Example, ½-cup measure of cooked rice OR 1 slice bread per meal. Small portions of protein food (meat, poultry, seafood, eggs, dairy, tofu). Example: 100 grams of meat or chicken per meal, or a portion about the size of a deck of cards. 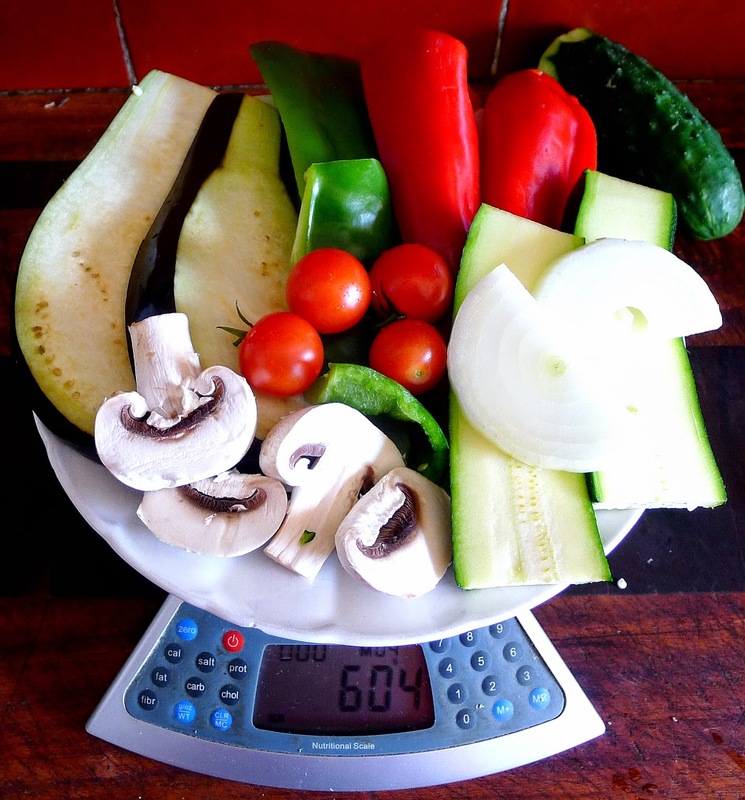 Large portions of low-carb vegetables, both lunch and dinner. 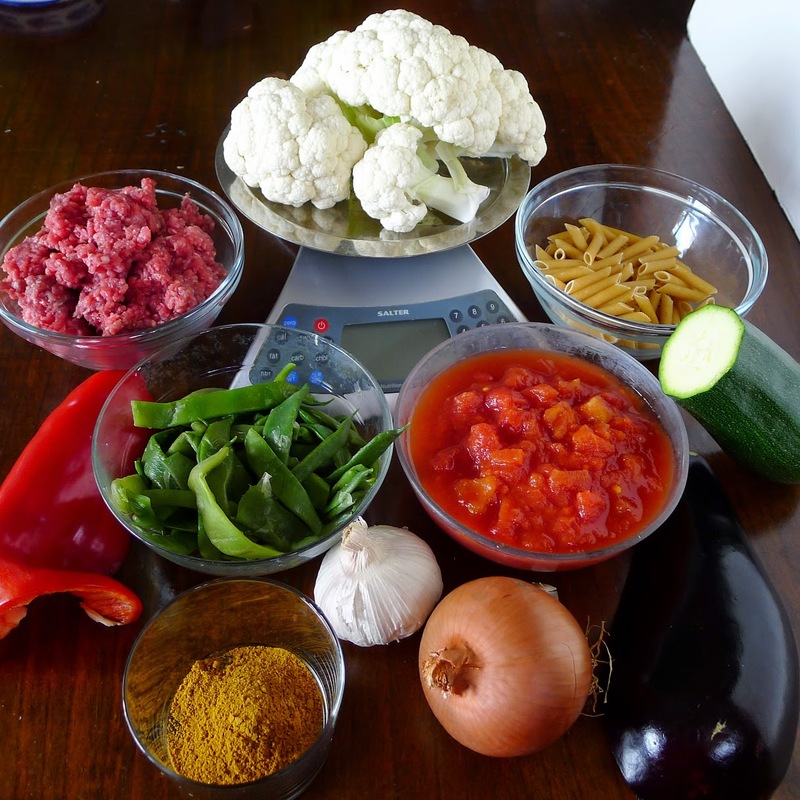 From 250 to 500 grams (½ to 1 pound), raw and/or cooked. Olive oil as the only fat (limited to 4 tablespoons per day). More exercise (I go to aerobics three times a week—not enough). 100 grams chicken = deck of cards. Don't have kitchen scales handy? 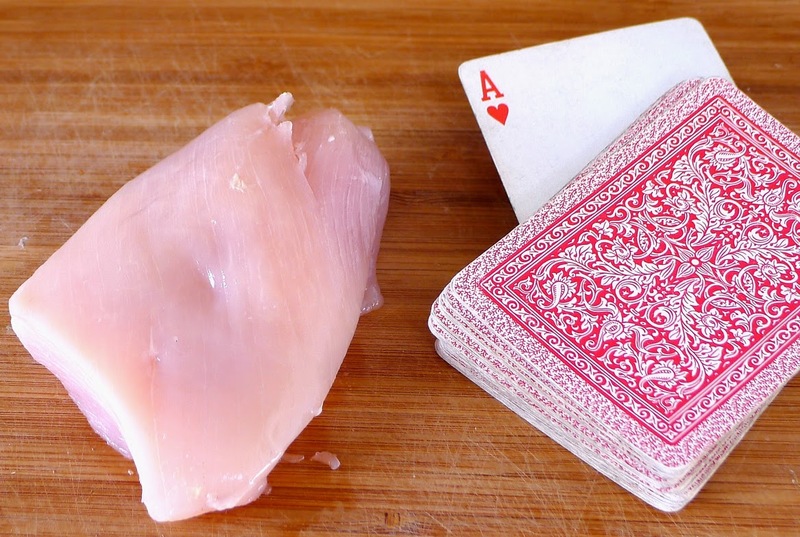 You can eye-ball it: a 100-gram serving of chicken or meat is about the size of a deck of cards. For seafood, allow 150 grams. 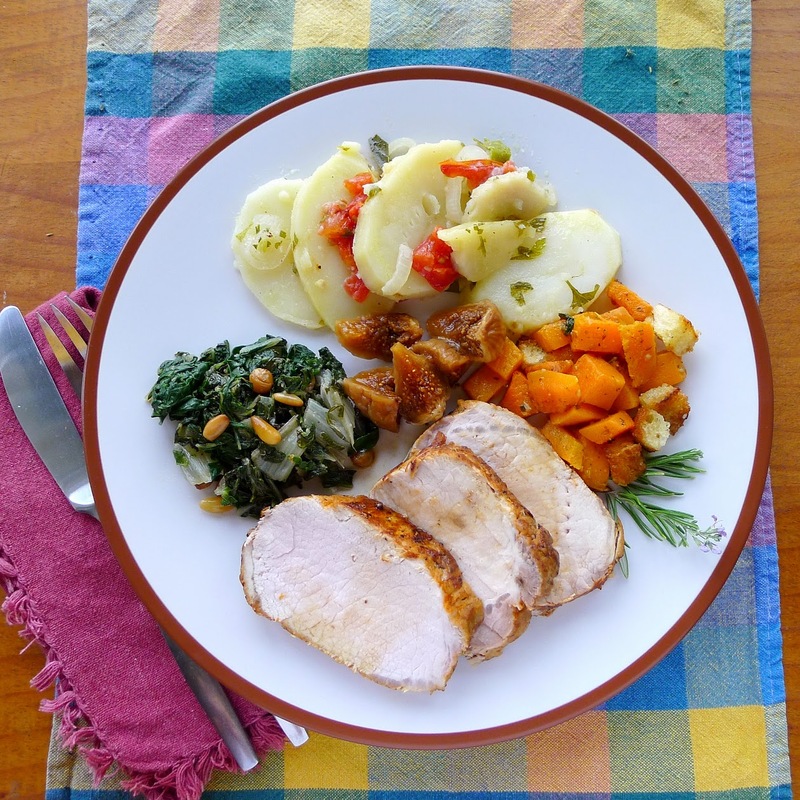 On the plate, low-carb veggies make up two-thirds of the serving; meat and starch together, only one-third. 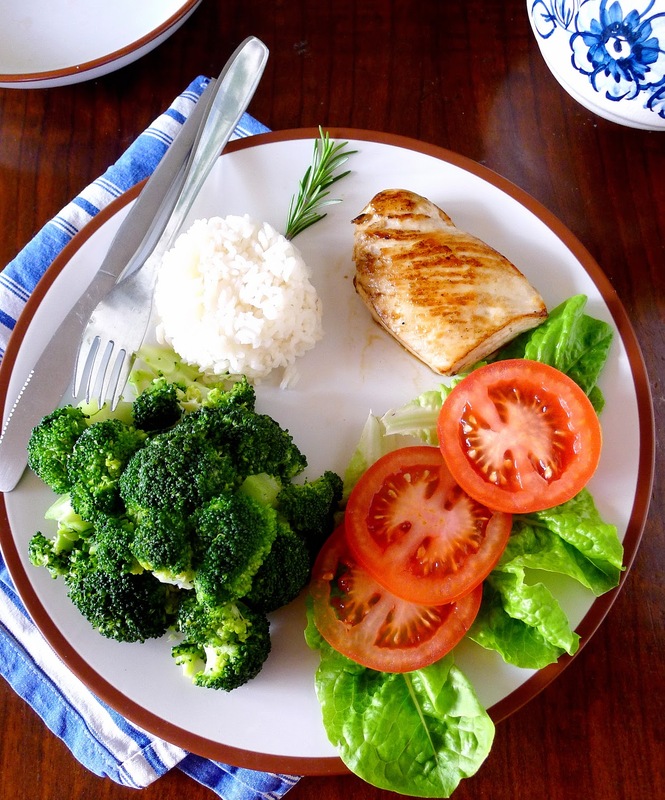 Diet on a plate--A heap of broccoli, some salad, a tiny piece of chicken breast, a little mound of rice. It's a well-balanced meal, but not very interesting. Mix up the vegetable ingredients, add a few spices, change the cooking method, add a saucy side dish (grated cucumber and yogurt) and the meal is much more exciting. 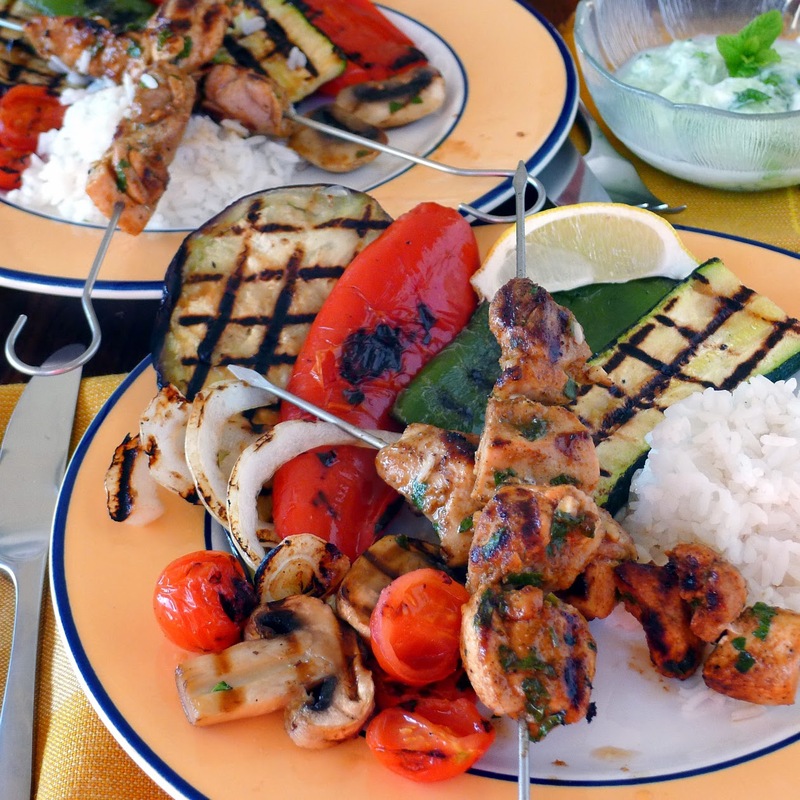 Spicy chicken kebabs, grilled veggies and rice. Ready-mixed pinchito spice, especia para pinchitos, contains lots of cumin, coriander, red chile, turmeric and ginger. It usually also contains salt. Use instead a spoonful of curry powder combined with ground cumin seed. The meat—here, chicken thighs—must be cut in quite small pieces, so that it cooks in the few minutes it takes to brown. Makes 4 mini-kebabs, serving 2. Combine the cumin, curry powder and cayenne, if using. Place the cubes of chicken in a non-reactive bowl and sprinkle with the parsley, garlic, salt, spice mixture and lemon juice. Combine well. Marinate, covered and refrigerated, for 3 hours. .
Thread 4 or 5 pieces of meat onto thin metal skewers. Cook them on a hot plancha (griddle), turning until browned on all sides, 7 to 8 minutes. 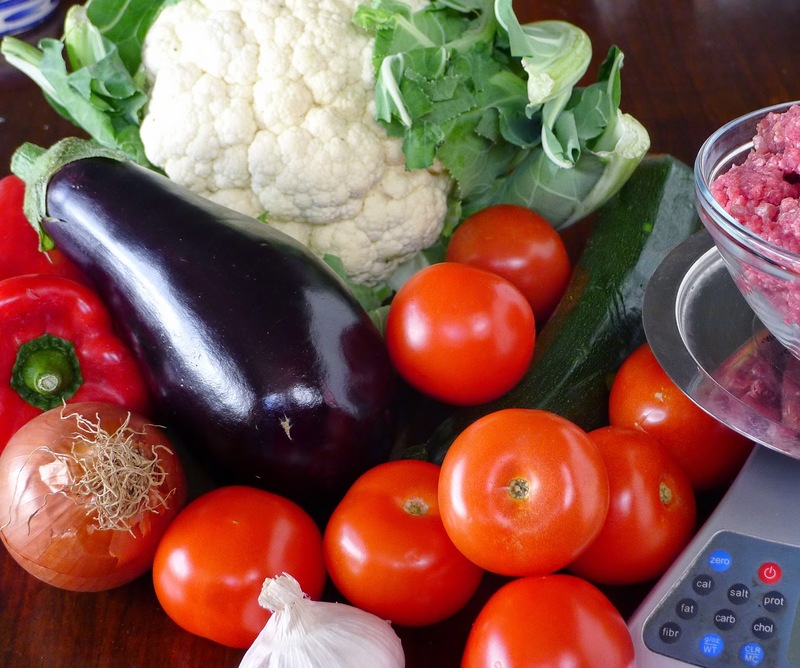 Cooking time will vary for each vegetable, depending on thickness, but all should cook in 8 minutes or less. Grill the eggplant very tender, but allow zucchini and onion to stay somewhat crisp. Other vegetables, such as asparagus, can be added to this mixed grill. Place the slices of eggplant and zucchini in a colander. Sprinkle with salt and allow to stand for 30 minutes. Pat the slices dry. Spread them in a shallow pan. Cut the peppers into quarters, discarding stem and seeds. Place them in the pan with the eggplant. Add onion slices, mushrooms and tomatoes. Brush all the vegetables with oil. Turn them and brush the other side. Heat a ridged grill pan or flat griddle very hot. Cook each of the vegetables until tender, turning them with tongs to grill both sides. Divide vegetables between two plates. Sprinkle with additional salt. Serve warm or room temperature. 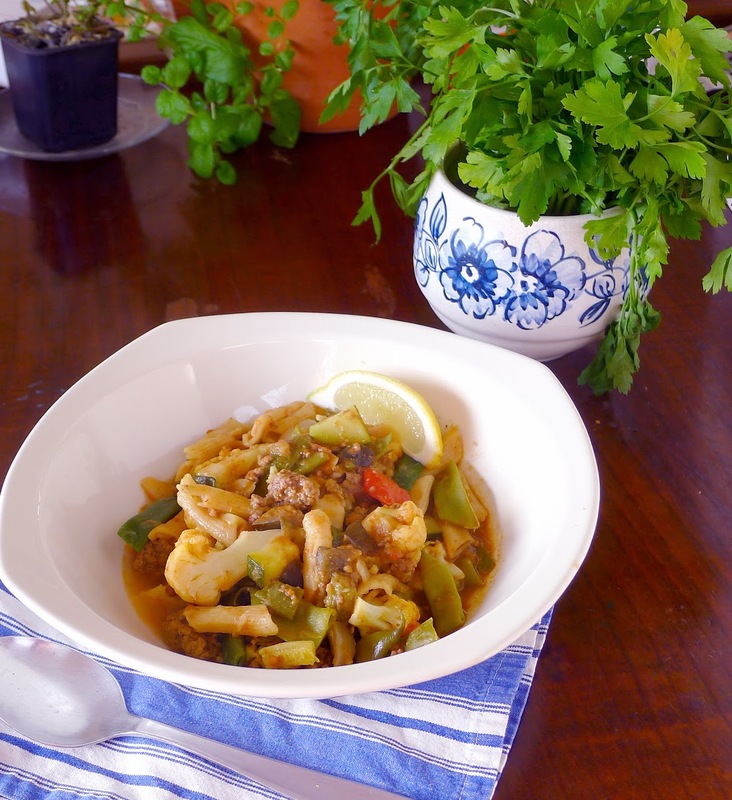 Here's another way to serve up lots of vegetables and small portions of carb and meat. Basura means “garbage”. That’s what my friend Luella called her meal-in-a-pot that she cooked in huge quantities to eat, sometimes twice a day, for a week. Lots of veggies, a tiny bit of meat and pasta, go into this meal-in-a-pot. Luella was a diabetic who hated to cook. Her doctor’s orders prescribed fixed amount of meat (100 grams), pasta or rice (20 grams) and vegetables, raw and cooked (300 grams) per meal, lunch and dinner. So, she measured it all out, multiplied by 10 and dumped it all in two big pots. After cooking and cooling, it was stored in the fridge, providing 10 ready-cooked meals that she never had to think about. Because she also was on a salt-free diet, she used whopping-big amounts of curry powder to flavor the stew, sometimes varying it with chili powder mix that I made for her. When Luella was cooking basura, you could smell it throughout the barrio where she lived. The garbage-pot is not a soup, but a vegetable-rich stew. 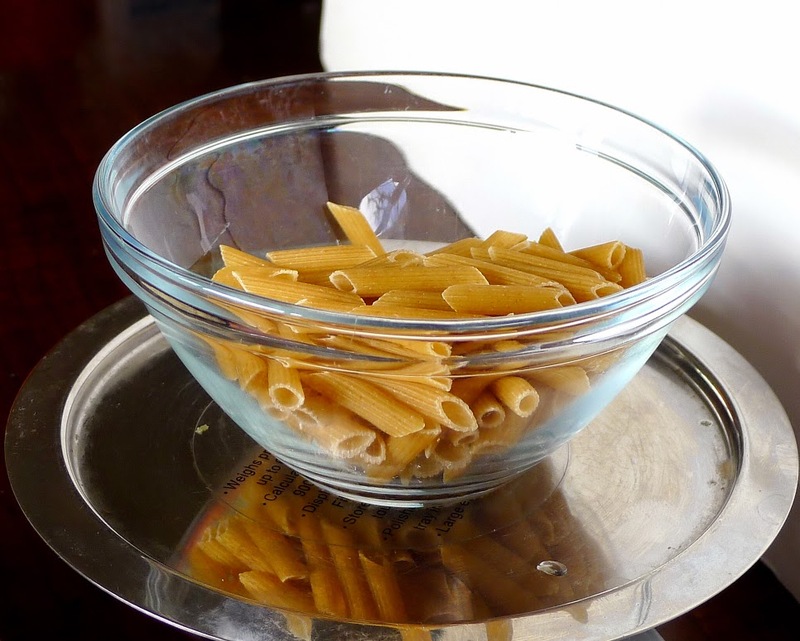 Rather than adding the carb—pasta—to the pot, as Luella did, I like the stew better ladled over a half-cup serving of brown rice. She didn’t mess around with “garnishes,” but I like snipped herbs or green onion to serve. Tips: Don’t peel the eggplant—its skin has cholesterol-reducing properties. 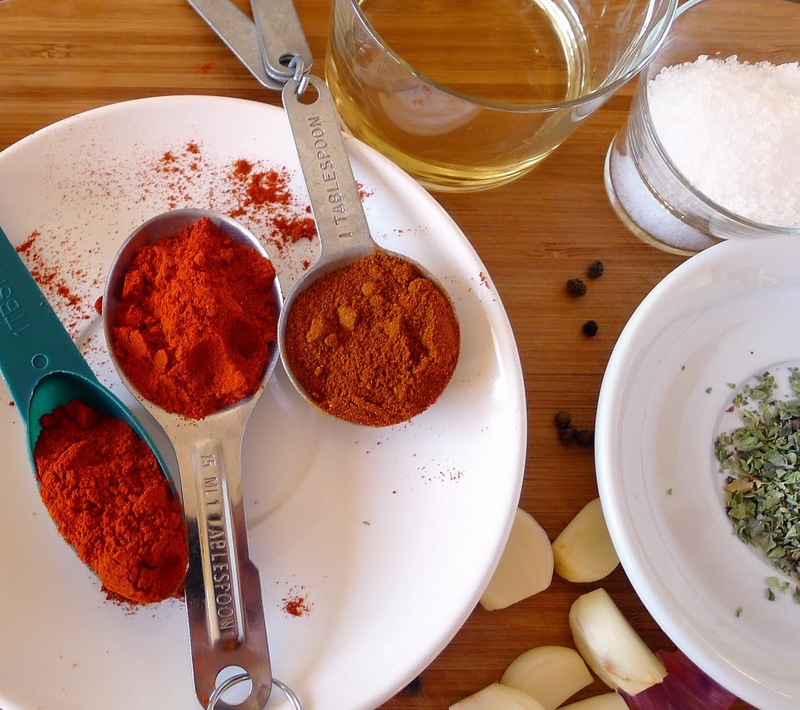 Add cinnamon and turmeric to the spice blend—they help to regulate blood sugar. 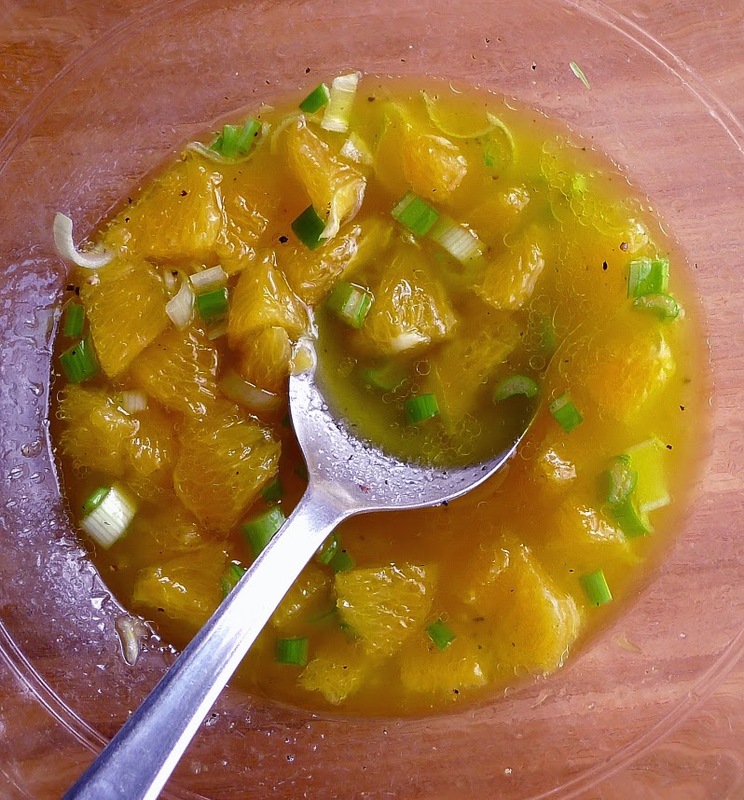 A splash of vinegar or lemon juice will accent flavors without adding salt. Luella's basura. OK, you give it a better name! Serve hot garnished with chopped onion. Add some chopped herbs to the basura. Tell me what you think of the new page format for MY KITCHEN IN SPAIN. Suggestions welcome.